aluminum frame. Advanced lighting control and large font keycaps deliver dynamic, vibrant multi-color backlighting. Speed RGB switches give you linear response and fast actuation. 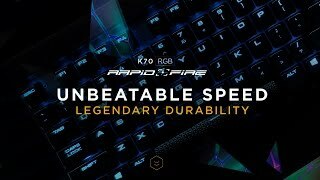 More links for "Gaming K70 RGB RAPIDFIRE Mechanical Keyboard, Backlit RGB LED, Cherry MX Speed RGB UK (CH-91"
Superb keyboard. I've tried quite a few mechanical ones recently, and been let down by the build quality. This is different - it's solidly built, the key feel on this is superb (don't be skeptical about Cherry Speed switches, they are awesome), and the RGB lighting is subtle and highly configurable to how you want the colours. I go for a very slow dark-ish pulsing colour gradient which just looks great. The volume wheel is a really nice touch, with a handy mute button right next to it, plus windows key lock (to prevent alt-tab in games). The key caps are well made, they look very durable, and the brushed metalic finish on the keyboard looks very slick too. The keyboard is great for writing and gaming. The speed in the name really means that your typing and key reaction is faster. I still need to use how the keys are sensitive to tapping. The biggest flaw are keys flashing random colours sometimes, perticularly when you use one of the rainbow options. I'm yet to experiment with custom ones. Currently I use colour shift where I did not notice any major issues with keys flashging. "touch the wood".